Fourteen outstanding research labs in developing countries around the world have been awarded scientific resources and equipment through Seeding Labs’ 2018 Instrumental Access program. Seeding Labs announced the 2018 Instrumental Access awardees at its third annual “Positively Instrumental” event held at Takeda Pharmaceuticals in Cambridge, Mass., on March 21. The event also commemorated Seeding Labs’ 10th anniversary, marking a decade of empowering global scientists to transform their communities. The 14 Instrumental Access awardees selected for Instrumental Access 2018 were hand-picked from a pool of 51 applications received from 22 countries—underscoring the worldwide need for scientific infrastructure, including lab equipment. During a rigorous vetting process, each Instrumental Access applicant outlined how an infusion of equipment would remove barriers to STEM education and research at their institution. They all felt strongly that equipment was essential to building much-needed scientific capacity that in turn, enables hands-on opportunities for students and new avenues of inquiry for researchers. In addition to introducing the new Instrumental Access awardees, Seeding Labs honored three donors from the private sector. They were recognized for their instrumental role in advancing science in the developing world in partnership with Seeding Labs. Thermo Fisher Scientific for pioneering programs that integrate participation in Instrumental Access with their core business, including instrument trade-in programs, cause marketing campaigns, and the engagement of their service division Unity Labs Services in managing quality control of donated equipment. MilliporeSigma, the Life Science business of Merck KGaA, Darmstadt, Germany, for initiating innovative ways to engage employees company-wide in Instrumental Access, including co-developing the TeleScience platform with Seeding Labs to share their expertise with global scientists, and developing participatory processes to mobilize equipment for donation. Takeda Pharmaceuticals for including the Instrumental Access partnership as part of their R&D Access to Medicines strategy, including equipment donation and virtual mentorships among employees and researchers in developing countries. Strategic partnerships and donations of funding and equipment from these honorees, as well as Seeding Labs’ 140+ other private-sector partners, will help the 2018 Instrumental Access awardees pursue their research across biological sciences, biomedical engineering, chemistry, chemical engineering, forensic science, pharmaceutical sciences, agriculture, oral health, veterinary medicine, and science education and pedagogy. Representatives from 11 of the 14 awardees were present at the event, indicating the excitement around the transformational nature of these awards. The equipment that will be sent to 2018 Instrumental Access partners is expected to impact nearly 15,000 undergraduate students, 1,200 graduate students, and more than 300 faculty members in the awarded departments alone—and likely many more across these universities. 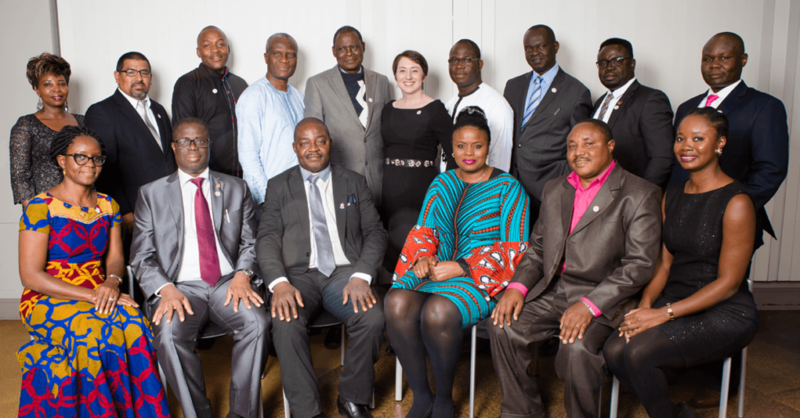 Dudnik spoke at the event, along with 2018 Instrumental Access awardee Enoch Achigan-Dako, PhD, an Associate Professor in Genetics and Plant Breeding at the Université d’Abomey-Calavi in Benin. The event was emceed by Ari Daniel, PhD, Senior Digital Producer, NOVA; Senior Producer, Story Collider; and independent science reporter. 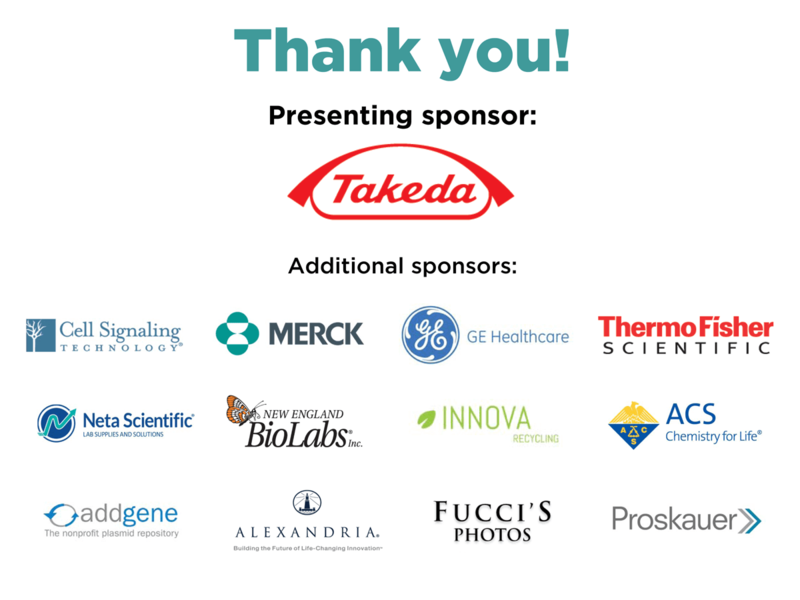 Positively Instrumental was sponsored by presenting sponsor Takeda Pharmaceuticals; anniversary sponsors Cell Signaling Technology and Merck; scientist sponsors GE Healthcare and Thermo Fisher Scientific; and fellow sponsors the American Chemical Society, Innova Recycling, Neta Scientific, New England Biolabs, Addgene, Alexandria Real Estate, Proskauer Rose, and in-kind sponsor Fucci’s Photos.